My goal when making this Clean Eating Bloody Mary (Non-Alcoholic) was to keep it clean and keep it simple. 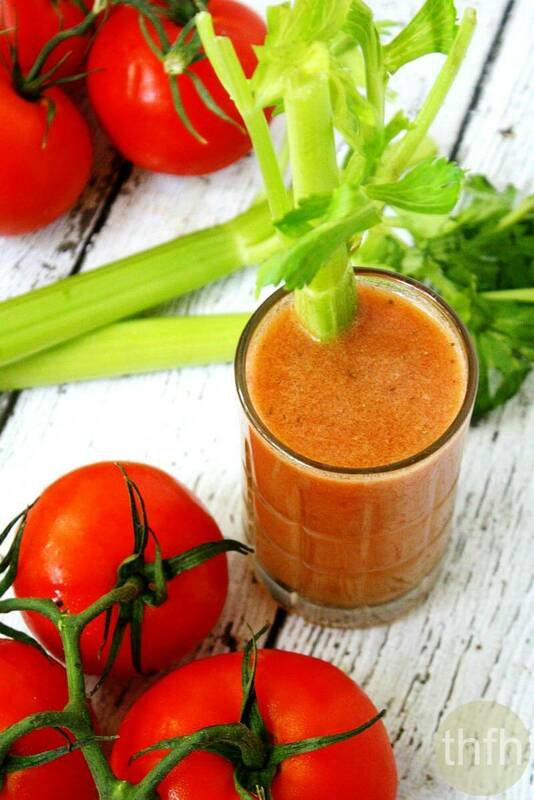 It’s really a basic recipe but I made mine with freshly juiced tomatoes using my Omega J8005 juicer, and using fresh juiced tomatoes instead of a processed pre-mix makes all the difference! It had such a clean taste to it! I was invited with a group of bloggers to participate in a Bloody Mary recipe round-up challenge by Williams-Sonoma and to be honest, had never had a Bloody Mary in my life. I actually had to go to a local eatery and order a non-alcoholic Bloody Mary to see what it tasted like and what taste profile I was going to try to replicate. So I had a nice little chat with the bartender who gave me the list of what was in the particular version I was about to drink. When it was delivered to me, it had a piece of bacon on the side?? a piece of salami?? and a tower of other unknown miscellaneous food items on a stick. After I tasted it, the flavors I detected were tomatoes, celery, salt and something hot (it was Tony Cachere’s). One of the ingredients she gave me was a pre-mix called “Zing-Zang”. Of course, as soon as I came home I looked it up on the internet and all I could think about was thank goodness I only took about three sips of it. The ingredient list is horrible and full of GMO’s, processed sugar and salt, MSG and wasn’t gluten-free or vegan! I won’t even tell you how much I paid for this GMO Bloody Mary. Ok, I will. $8.00. Same price as the alcoholic version too. The juicer I used, an Omega J8005 (a low-speed masticating juicer), is a powerhouse but I primarily purchased it because it was the best for juicing leafy greens and wheatgrass. I also own a Breville juicer which is nice because you don’t have to cut up your fruits and veggies before juicing like you do with the Omega juicer. But since I was juicing tomatoes today, it really wasn’t a problem because they were so soft, with a gently push, the went right down the chute in 1/4 size pieces. 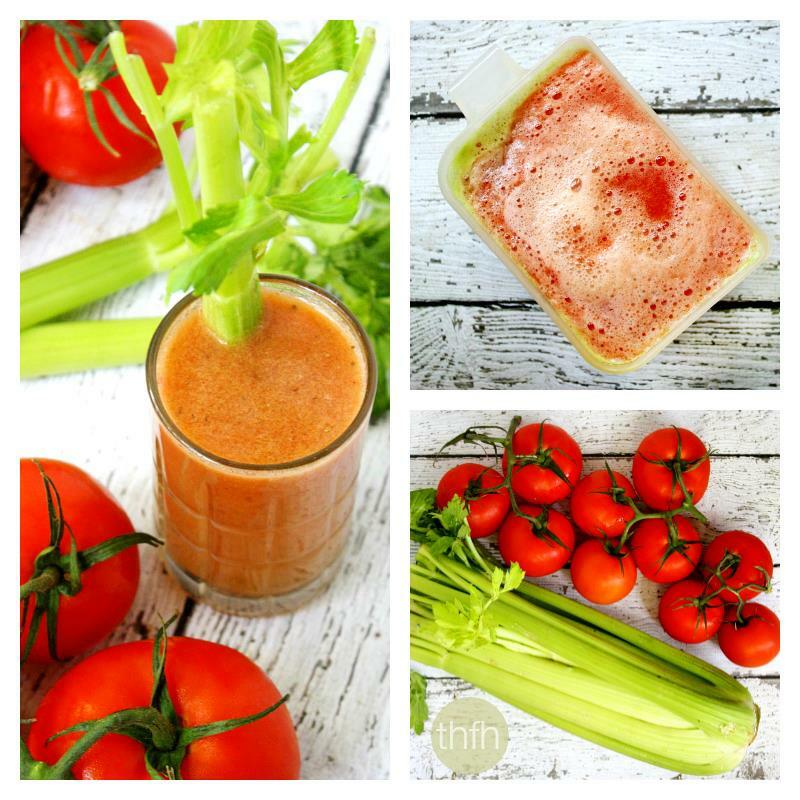 Because the tomatoes were “soft”, I alternated hard/soft as I juiced…piece of celery, piece of tomato, piece of celery, piece of tomato, etc. The celery helped to push the tomato through more easily. 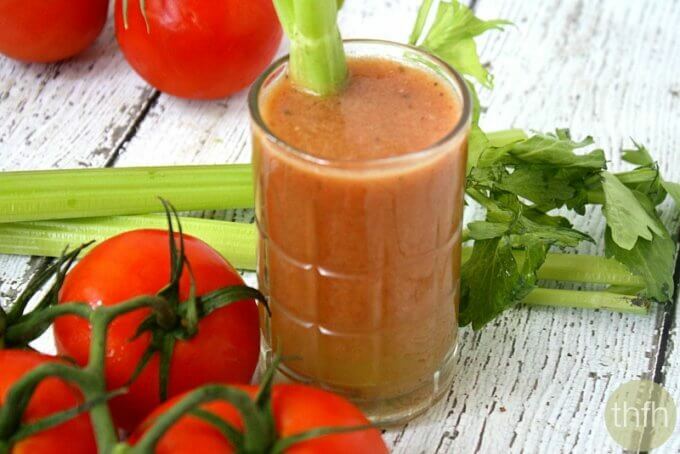 Once I finished juicing the tomatoes and celery, I strained the pulp…and had to do this several times because of the tomatoes. With a little patience, I ended up with a beautiful pale red juice that smelled unbelievable! I played with the seasonings a little and got them exactly where I liked them…but everyone is difference so adjust them if you prefer. One important note…start very light with the cayenne pepper! I actually ruined the first batch I made because I put too much and couldn’t even drink it. I would use just a tiny pinch and taste and see if it needs more before adding any extra. You want a little, faint touch of heat, but not so much that it overpowers the drink or that it’s too hot to drink. 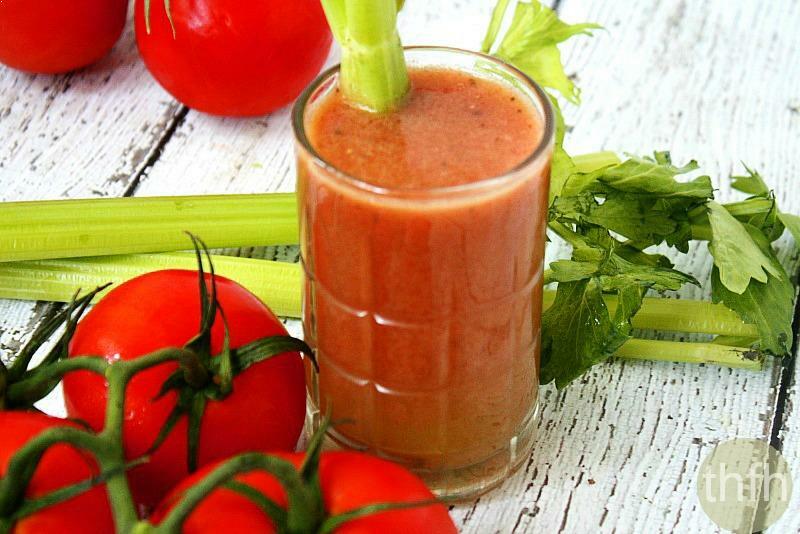 I would think getting a Bloody Mary from a bar or restaurant using fresh juiced tomatoes is a rarity, but if you make one at home, there is nothing like the flavor and aroma of fresh juiced tomatoes. Skip the pre-mix with preservatives, GMO’s and other unhealthy ingredients…fresh is best! Want more healthy recipes? Check out Beet and Celery Juice, Cucumber Apple and Beet Juice, Carrot Apple and Celery Juice or my Clean Eating Cookbook with over 140 healthy, clean eating recipes just like this one that you will love! Tip #1: This recipe will make (2) small glasses or (1) large glass. Tip #2: You can use your favorite variety of tomatoes…I used vine-riped tomatoes to make mine. Tip #3: Adjust seasonings to your preference…start light with the cayenne pepper (just a tiny pinch). Step 1 Using a juicer (I used an Omega 8005), juice the tomatoes, celery and garlic cloves (alternating the tomatoes and celery). Strain the pulp from the juiced veggies and add the strained juice to your glass. Add the seasonings (celery seed, garlic powder, Himalayan pink salt and cayenne pepper) and stir well; adjust to your preference. Note: start with a very small pinch of cayenne and only add more if needed. This recipe will make approximately 1 1/2 cups, or 2 small servings or 1 large serving. The recipe and photographs for "Clean Eating Bloody Mary (Non-Alcoholic)" by Karielyn Tillman of The Healthy Family and Home are licensed under a Creative Commons Attribution-NonCommercial 4.0 International License and cannot be used without my written permission. Thank you for this beautiful post. I’m going to try to adapt it to make a smoothie. I also have never tasted a bloody Mary but this sounds really good. I liked the way you have listed the health benefits of the individual ingredients. Hi there! I would have never thought to make it into a smoothie, but it sounds very interesting!